Photo. 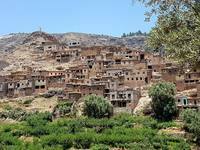 The foothills of the High Atlas mountains in Morocco are home to several Berber villages. © Travel Explorations. Deep in Morocco’s Atlas Mountains, the ancient Berbers struggle to survice in a harsh environment, and are still remain loyal to their traditions and way of life. They call themselves the Amazigh, which is believed to mean “free people” or “noble men,” and trace their origins as an indigenous people in western North Africa to at least 10,000 BC. Here I experienced the beauty and hospitality of Moroccan Berber culture. Enjoyed a traditional Berber lunch and visited a Berber family in a rural village. Observed shepards tending flocks of sheeps in the amazing landscape. The Berbers were Morocco’s original inhabitants. The Arabs arrived at the end of the seventh century, after sweeping across North Africa and the Middle East in the name of their revolutionary ideology, Islam. So nearly all the Berbers converted to the new religion and were immediately accepted as fellow Muslims by the Arabs. Their home is the majestic Atlas, the largest mountain range in Africa. Amazigh villages are scattered across arid desert landscapes with burnt-orange rock, occasionally dotted with lush green slopes and surrounded by snow-capped peaks. The name Berber comes from the name given to this people by the Romans, meaning barbarians. The history of the Berber people in northern Africa is both extensive and diverse. Their oldest ancestors settled in the East of Egypt. Many are the references to this old people in Greek, Roman and Phoenician texts. In fact, Berber is a generic name given to numerous heterogeneous ethnic groups who share similar cultural, political and economical practices. Today, they rely on cattle and agriculture as their main sources of income, and maintain a nomadic lifestyle closely resembling their ancestors. Some live in clay houses with no electricity or running water, while a few still dwell with their sheep and goats in remote mountain caves. Others live closer to the towns at the Atlas foothills, benefiting from modern amenities. Berber, self-name Amazigh, plural Imazighen, any of the descendants of the pre-Arab inhabitants of North Africa. The Berbers live in scattered communities across Morocco, Algeria, Tunisia, Libya, Egypt, Mali, Niger, and Mauretania. They speak various Amazigh languages belonging to the Afro-Asiatic family related to Ancient Egyptian. At the turn of the 21st century, there were perhaps 14 million in Morocco, 9 million in Algeria, and much smaller numbers in Tunisia, Libya, Egypt, and Mauretania; in the Sahara of southern Algeria and of Libya, Mali and Niger, the Berber Tuareg number about 1 million (Source: Encyclopædia Britannica, read more articles here about the Berbers).